VIDEO - Exactly 25 years after launching their struggle for equality and freedom of religion at the Western Wall plaza, members of the Women of the Wall organization held their traditional Rosh Chodesh (first day of Hebrew month) prayer at the holy site in Jerusalem, this time in a particularly festive format with hundreds of supporters form Israel and abroad. The organization members arrived at the women's section at around 8 am Monday in order to pray according to their custom – with prayer shawls and phylacteries. They were faced by hundreds of ultra-Orthodox girls who arrived for a quiet show of protest and held their own prayer at the site. There were no unusual incidents or clashes between the two groups. Ahead of the first day of the month of Kislev, national-religious girls were urged to participate in the haredi rally, but to no avail. Rabbi Benny Nechtailer, director of Bnei Akiva's yeshiva education network, recommended that the institutions' female students join the struggle but was turned down politely by the principals who chose to maintain the study routine and not drag the students to a protest. Only several dozen girls and their teachers were present at the rally. The Women of the Wall launched their battle in the winter of 1988, when dozens of women arrived at the holy site covered with a prayer shawl and holding a Torah scroll, seeking to read from it under the claim that such an act does not contradict the Halacha. Haredi men and women tried to interrupt their prayer, saying that such a ceremony was not in line with the conservative custom of the place. The prayer turned into a monthly event, and the Western Wall became a site of clashes between the sides, usually verbal but sometimes physical too, until the group of women petitioned the High Court of Justice, demanding freedom of religion that would allow them to pray according to their custom at the holy site. The International Committee for Women Of the Wall (ICWOW) later petitioned the court as well, claiming that the matter was of utmost importance for Jewish world around the world. An interim order issued by the court stated that the women would not be allowed to pray at the site with Torah scrolls and prayer shawls. In January 1994, the petitions were denied but the judges recommended the appointment of a governmental committee to discuss a compromise. Such a committee was indeed established, but repeated delays in its work led to another intervention by the High Court, until another committee – this time of government ministers – was appointed to discuss the issue. The Women of the Wall were unsatisfied with the committee's conclusions, arguing that they did not receive their legal and halachic rights on the site, and the State suggested appointing a third committee to bridge between the sides. The Ne'eman Committee convened for the first time in 1988, and in September that year submitted a report recommending that the group's activity be relocated to the Robinson's Arch area, which is adjacent to the Western Wall from its southern side and is basically a continuation of the same retaining wall of the Temple Mount. The court urged the government to reach a permanent solution within a six-month period, and at the same time Knesset members attempted to enact laws aimed at restricting the Women of the Wall's activity – but were unsuccessful. In 2000, High Court judges ruled that the State must allow the women to pray at the Western Wall plaza. Following an additional discussion, at the State's request, it was decided that the woman would do so at Robinson's Arch. Since then, basically, the observance of several religious mitzvot by the women – like laying tefillin, covering themselves with a prayer shawl and reading from the Torah – became a criminal offense, yet the women did not leave the Western Wall. They continued praying there on the first day of every month, at an early hour, under the restrictions imposed on them, and in some cases tried to violate them. The tensions between the liberal organization and conservative religious groups had ups and downs. In November 2009, on the first day of the month of Kislev, police arrested Women of the Wall member Nofrat Frenkel after she put on a prayer shawl, and the incident led to an unavoidable flare-up. Several months later, Women of the Wall Chairwoman Anat Hoffman was also detained for questioning for the same offense. Since then, arrests during or after the women's prayer became almost routine at the Western Wall plaza. World Jews were outraged by the deprivation of freedom of religion at the holy site, and began exerting heavy pressure on the State of Israel. In 2012, Prime Minister Benjamin Netanyahu asked Jewish Agency Chairman Natan Sharansky, to come up with a solution which would be accepted by all Jewish denominations in Israel and abroad. According to an outline formed by the Jewish Agency chairman, the Western Wall plaza would be extended to Robinson's Arch and divided into three equal parts: For men, women and a mixed public. In a prayer held several days after the outline was first revealed by Ynet, the group of women clashed with haredi worshippers and some of them were even detained by the police. The Jerusalem Magistrate's Court later ruled that there was no reason for their arrest. The District Court took the matter one step forward, providing a new interpretation of the High Court decision on the Women of the Wall and ruling that they were never forbidden to pray according to their custom – with a prayer shawl and tefillin. Encouraged by the unprecedented ruling, the Women of the Wall declared that "the rules of the games have changed." 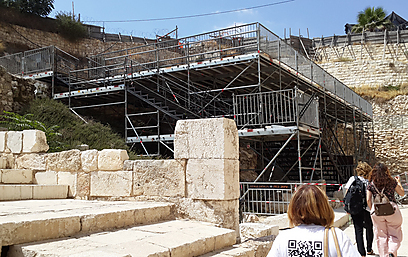 But Religious Affairs Minister Naftali Bennett announced, after consulting the attorney general, that he would emphasize the holy sites regulations so that its interpretation would not be ambiguous. The revelation drew harsh public criticism and tensions heated up. 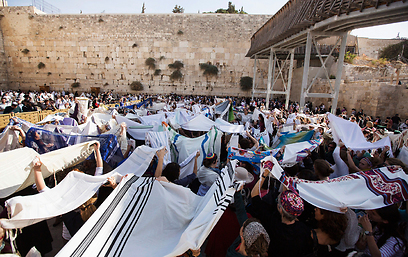 During the following Rosh Chodesh prayer, thousands of haredi men and women arrived at the Western Wall in a bid to overshadow the prayer of dozens of Women of the Wall members. Police forces tried to create a human barrier between the two groups, but violence was inevitable and led to the arrest of three protestors. 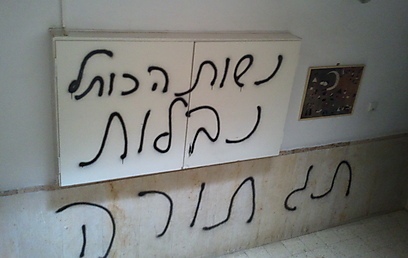 Threat letters by anti-haredi sources were sent to then-Chief Rabbis Yona Metzger and Shlomo Amar, while "Torah tag" graffiti was spray-painted outside the home of Peggy Cidor, a member of the Women of the Wall board. In a further attempt to calm things down, Minister Bennett announced the opening of a new prayer plaza, "Ezrat Israel," in which men and women may pray together with prayer shawls, but the Women of the Wall responded angrily to the initiative, referring to the site as a "sunbathing balcony." A surprising turnabout occurred several weeks ago, when the Women of the Wall expressed their agreement in principle to give up on their demand to pray at the central plaza in exchange for full equality at an alternative site. The conditions they set include taking part in running egalitarian plaza and restricting the Western Wall rabbi's authorities. See all talkbacks "Women of Wall mark 25 years of struggle"